This is a much-delayed post. Many things happened in between. A close friend said good-bye forever, wedding in the family brought another member to family and welcomed the New Year with many new resolutions with family. One of them is to write the post on a regular basis. I hope I will not break this resolution, which usually happens with all of us. After a long break, I was unable to decide what I should write about but a cow got me so inspired on my vacation that I want to dedicate my first post of New Year to it. On a short holiday, away from chilling winters of Delhi, I was feeling more rejuvenated and full of enthusiasm, my usual self. 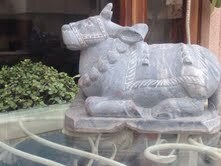 During one of our shopping tours I saw this cow. The moment I saw it, I wanted to take it home. 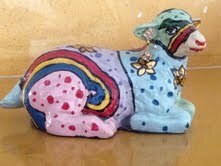 It was looking so pious and angelic, quite different from my other cows, which are more hoity and fashionable!!! Yes! 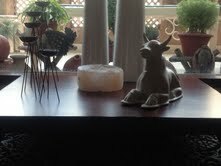 I am talking about my ceramic cows and stone bull. Two years back, on a tour to Jaipur with my daughter, we stopped at a stone craft shop on the way. Outside the shop, few damaged pieces were lying. One of them was a grey bull, which drew our attention. Its one horn was broken. 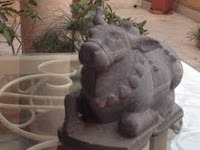 The look on its face was, “my horn is damaged but it’s not my fault!” We decided to take it home despite the shop owner’s warning that damaged statues are inauspicious. Of course, it is unlucky but only for the statues because they are ignored. It found a graceful place in my balcony, sitting there like the owner of the small green territory. 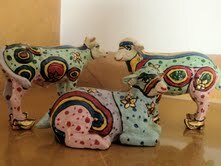 Within next few months I found my trendy young cows adorning the show window of a kitsch art shop. 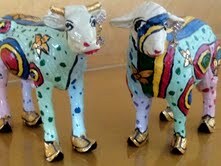 The two of them were with an equally fashion conscious bull. They were wearing exciting body colors and flashing ornaments. I brought them home with zeal. Everybody found them very carefree and joyful. All three of them were too fragile to sit outside. So, I decided to make them sit in my living room. They are attention seekers and always get noticed by my guests. It seems when nobody is around; these three discuss every visitor to their territory. The new member to my cow family, whom I had earlier mentioned, has a more mature look. She is very simple and unlike the three fashionistas sitting in the living room, she seems to have more of a bovine persona. She has a peaceful aura around herself. When I look carefully, it seems that she has just got up from her meditation session. Her simplicity is impressive. She does not seem to like the company of my fashion conscious cows. I was thinking of making her sit next to my stone bull, but I realized that probably he will not like to share his space with a new member and his male ego may get hurt. Besides this, she looks strong emotionally, but physically, she doesn’t look strong enough to bear the severe weather conditions. After all, she has the female fragility too. After taking into consideration all the factors, I placed her in my living room. She is sitting at a distance from the other group. Her place is more commanding, where she can meditate without any interruption. Maybe her aura and maturity will motivate my young cows someday!!! !